This modern apartment is located within Barcelona’s old town, in the Barrio Gótico. This area is renowned for its bars and cafés as well as its rich history. Nearby you will find a number of supermarkets. This area is within walking distance to Plaça Catalunya, considered the heart of Barcelona, as well as Barcelona’s many sandy beaches. The rest of the city is easily accessible by public transport including train, metro and bus. The apartment itself is modern and tastefully decorated throughout. There are two bright bedrooms meaning this apartment can comfortably sleep up to three people. 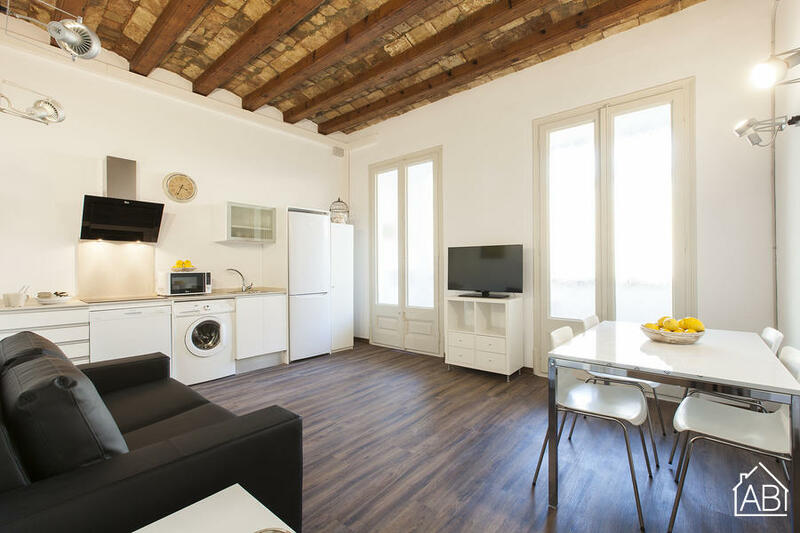 There are also 2 bathrooms and a kitchen with a microwave and hob cooker, allowing you to prepare your favourite meals in the comfort of this lovely Barcelona apartment. For your convenience, this apartment has its own washing machine and dishwasher as well as an Internet connection. Equipped with heaters and air conditioning, this lovely apartment is the ideal Barcelona home all year round. Please note: this building does not have an elevator.